Store potatoes in a cool, well ventilated place. Colder temperatures lower than 50 degrees, such as in the refrigerator, cause a potato’s starch to convert to sugar, resulting in a sweet taste and discoloration when cooked. If you do refrigerate, letting the potato warm gradually to room temperature before cooking can reduce the discoloration.Don’t wash potatoes (or any produce, for that matter) before storing. Dampness promotes early spoilage. 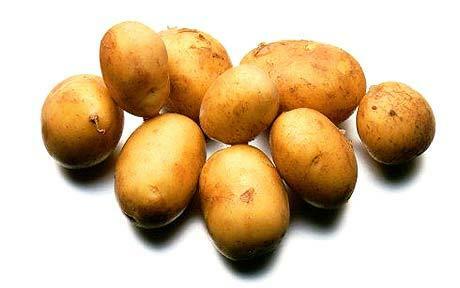 Potatoes are a good source of Vitamin C, Vitamin B6, Potassium and Manganese. Potatoes were often eaten aboard ships to prevent scurvy because they are loaded with vitamin C.
The first “French fry” was allegedly first served in the United States by Thomas Jefferson at a presidential dinner.